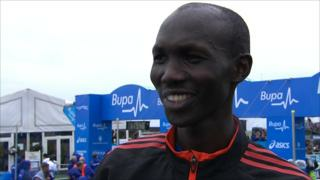 Wilson Kipsang sprints past fellow Kenyan Micah Kogo in the closing metres to win the 2012 Great North Run. Kipsang, who took bronze in the London Olympic marathon, produced a late surge to win the half marathon in 59 minutes and six seconds. Ethiopia's Olympic 10,000m champion Tirunesh Dibaba won the women's race on her half-marathon debut.